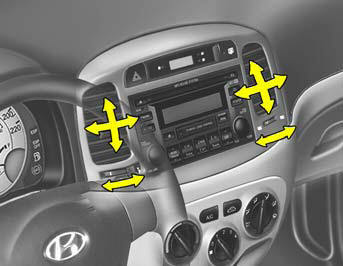 The center ventilators are located in the middle of the dashboard. The side ventilators are located on each side of dashboard. To change the direction of the air flow, move the knob in the center of the vent up-and-down and side-to-side. The vents are opened when the vent knob is moved to " "
position. The vents are closed when the vent knob is moved to " ". Keep these vents clear of any obstructions.